everyone loves to begin their day on a good note. An electric kettle, whether made of glass or stainless steel, is one of the most important kitchen appliances that we tend to use on a daily basis. led to electric kettles replace gas stove and oven completely. Whether you want to have a crisp cup of tea or coffee, you want to grab a quick bite of your favorite instant noodle or go for a boiled egg, electric kettles come handy in all such cases. But life becomes extremely difficult and irritating if you are stuck with the wrong appliance. But worry not as we are here to sort out your life. After a lot of intense research and analysis the 4 basic criterions, viz., basic functions, kettle capacity, design aspect and safety features, we have brought to you 2 of the best electric tea kettles in 2018. Also known by the name of “10 Cup Electric Kettle”, this cordless electric kettle is craftsmanship marvel from Hamilton Beach - a highly renowned electric appliance company. If you are looking for a cordless, handy and portable electric tea kettle, this one is it. As the name suggests, the Hamilton Beach 10 Cup Electric Kettle has the capacity to give you 10 cups of hot boiling water at one go. When it comes to the overall look of the kettle, this beauty from Hamilton Beach pleases you with its minimalistic design. The body and spout of the cordless kettle is made up of high quality stainless steel, the lustre of which impresses the onlookers. 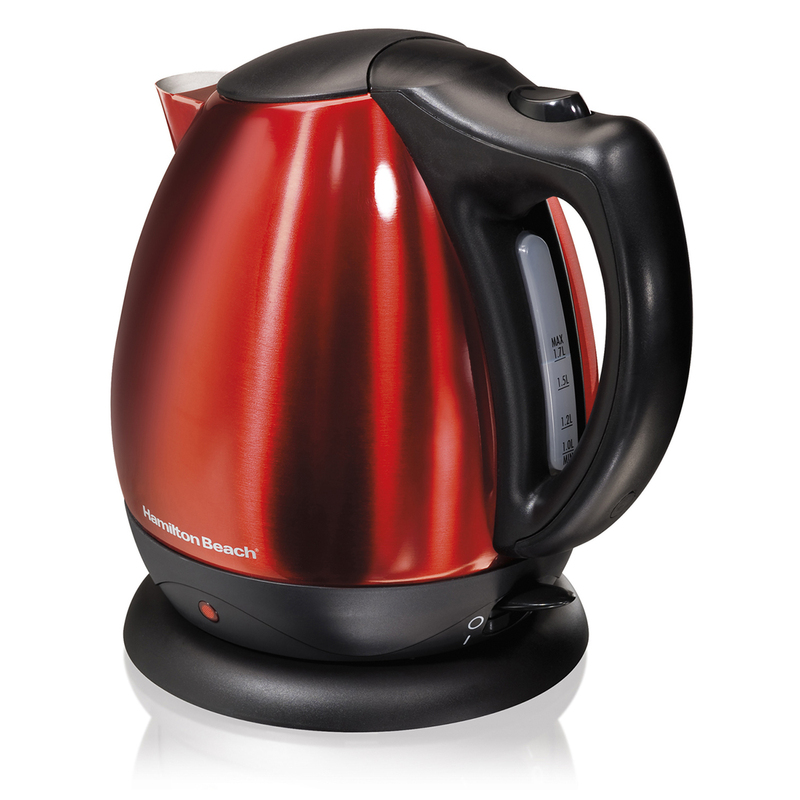 With an imposing core design, the electric kettle comes in two major color options - lustrous red and stainless steel. For safety reasons, the heating elements of the kettle are concealed within. The weight of the kettle is approximately 3.2 pounds. The simple fact that this kettle is cordless makes it extremely easy for the user to carry it easily wherever need be. Another prominent features of the kettle that add to the ease of use are - a 360 degree rotatable kettle base and a sturdy handle that surprisingly stays cool even when the kettle is full of super-hot boiling water. Another noteworthy feature of the Hamilton Beach 10 Cup Electric Kettle is the boiling time. The total time taken by the kettle to boil a total of 10 cups of water is less than 5 minutes. The kettle comes with two great features - Auto Shut-Off and Red Light Indicator. The former features is quite intelligent and prevents the kettle from running boiling dry. The latter feature lets you know if the kettle is in use. With features like cordless (the cord actually situated at the base) and sturdy handle, this masterpiece by Hamilton makes a user friendly, portable electric tea kettle. The concealed heating elements and auto shut-off attributes makes this kettle very safety and secure. With so many useful features, this stainless steel electric kettle by Hamilton is pretty inexpensive. The only shortcoming of this kettle can be the absence of an indicator that lets the user know from afar that water has boiled. As a conclusion, we give full marks to the Hamilton Beach Electric Kettle when it comes to design, usability and performance. Hamilton Beach, the number one kettle brand in the U.S. Once you lay a hand on this glass kettle, you will realize that this is by far one of the best electric kettles in this price range. The fully transparent glass body of the kettle makes it a beautiful masterpiece. Moreover, when turned ON, the contemporary soft blue hue illumination in the glass chamber gives this daily use kitchen appliance a marvelous look. Just imagine, you enjoying a warm cup of tea with a light blue ambient environment created by the kettle. Simply amazing. Don’t get surprised if your guests suddenly start feeling envious and mesmerized every time you serve a hot cuppa. The Hamilton Beach 40865 Glass Electric Kettle also has a wide opening which makes cleaning and wiping an easy task. Also, the compact design of the kettle makes it an easy fit when it comes to storing it in the kitchen cabinets. With Hamilton Beach 40865 Glass Electric Kettle, bid adieu to all the entanglements that come with wires. The pitcher of the kettle easily detaches from the base and hence makes no-cord serving extremely useful. This full glass body electric kettle comes with a built-in wire mesh filter. This lets you easily filter out unwanted particles out of your favorite hot beverage. So now enjoy your warm cuppa without the intervention of any unwanted particles, even small fragments of hair. intelligent kettle automatically shuts off whenever the water within reaches the boiling point. Hence, even if you go to attain some important task while the kettle is kept on boiling, the kettle will never run boiling dry. This useful creation by the Hamilton Beach comes laden with quite a few pros. Cordless serving, auto shut-off boiling point protection, easy to clean and quick boiling time, makes this kettle one of a kind. quite durable. You will have to make use of it with extreme carefully. built-in features makes this kettle an extremely user-friendly kitchen appliance. So what are you waiting for? Get set and bring home any of the two best electric tea kettles in 2018 and adore your kitchen.